I couldn't help but join in with Laurie's National Scrapbooking Day celebration. It's been a long time since I've shared any scrapbooking layouts. This is a 6x6 layout to insert into a baby scrapbook. 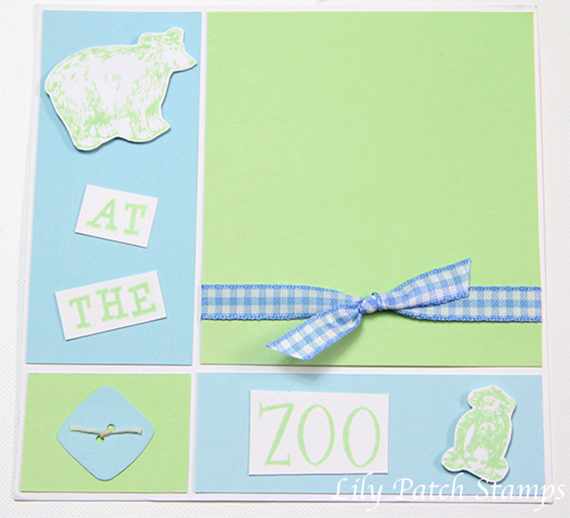 I stamped the bear and monkey then fussy cut and adhered them onto the blue cardstock pieces. The button is from an old Sizzix die. Such a sweet layout! Love the colors! Thank you for joining us at HIMCR! Such a sweet page!!! Thank you for joining us over on the HIMCR celebrating NSD!